Organisers of Sunday's Olivier Awards have apologised for omitting director Sir Peter Hall from a tribute segment shown during the ceremony. "We are hugely sorry for the oversight of leaving Sir Peter Hall out of our In Memoriam," said the Society of London Theatre (SOLT) in a statement.The founder of the Royal Shakespeare Company and former National Theatre director, died in September, aged 86.The failure to mark his death prompted dismay and disbelief on social media.Olivier-winning choreographer Sir Matthew Bourne said the omission was "unforgivable", while actor Christopher Biggins called it "disgraceful". 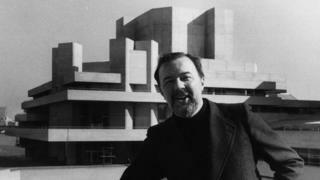 Film actor Sir Roger Moore, US pop star David Cassidy and RSC co-founder John Barton were among those whose names and faces were projected on a screen.Yet there was no mention of Sir Peter Hall - a man SOLT called "a peerless British director and theatre impresario" when he died last year. "@OlivierAwards could you please explain why Peter Hall was not included in the list of people we have lost this year?" wrote one Twitter user.Her sentiments were echoed by theatre PR Kevin Wilson, who said it was "truly shameful that Sir Peter Hall was missed off the RIP section." In a statement on Monday, SOLT described Sir Peter as "a wonderful and inspiring figure within the UK theatre industry" who was "sorely missed".The society added that it had arranged for theatre lights in London's West End to be dimmed when he passed away last year.Hip hop sensation Hamilton was the big winner at this year's Oliviers, receiving seven awards including best new musical.Catherine Tate hosted the ceremony, which saw other prizes go to Bryan Cranston, Sam Mendes and Doctor Foster's Bertie Carvel. Stephanie Arditti, costume supervisor; James Barber, theatre director and producer; Roy Barraclough, actor; John Barton, RSC co-founder; Hywel Bennett, actor; Rodney Bewes, actor; Lee Blakeley, director; Michael Bogdanov, director; Paul Brown, designer; Bill Brohn, orchestrator; Bob Carlton, writer and director; David Cassidy, musician and actor; Emma Chambers, actress; Barbara Cook, actress; Sir Ken Dodd, comedian; Norma Dunbar, actress; Bella Emberg, actress; Sir Bruce Forsyth, entertainer and comedian; Robert Hardy, actor; Lincoln Hudson, actor; Sean Hughes, actor and comedian; Rosemary Leach, actress; Thomas Meehan, writer; Bill Mitchell, director; Sir Roger Moore, actor; Christopher Morahan, director; Bernard Pomerance, playwright; Stuart Thompson, producer; Peter Sallis, actor; Sam Shepard, playwright; Benjamin Whitrow, actor.